Traveling to Georgia in recent years has been growing fast. 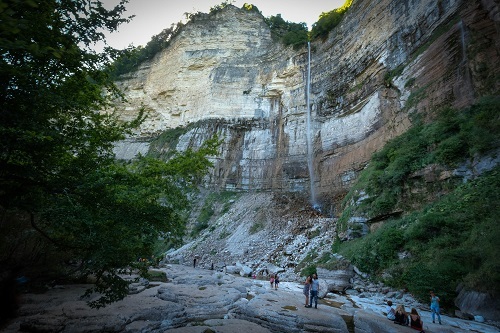 If few years back only few people could find this Caucasus country on the map, everyone who enjoys nature, outdoor and hiking, did put it on their travel bucket list now for sure. If you might never thought of traveling to Georgia, check out the best 12 Georgia tourist attractions and think again. 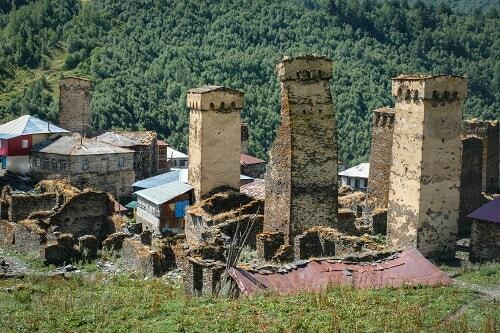 One of a kind thing of the Svaneti region are its Svan towers – for sure one of the most unique Georgia tourist attractions, which cannot be found anywhere else in the world. They were used as a defense towers, but some of them are still used for living. You will see many of them in Mestia, but for the best views we recommend you to visit the remote Ushguli, which is put under UNESCO due to them. Due to its hilly landscape, Georgia is also rich with canyons. 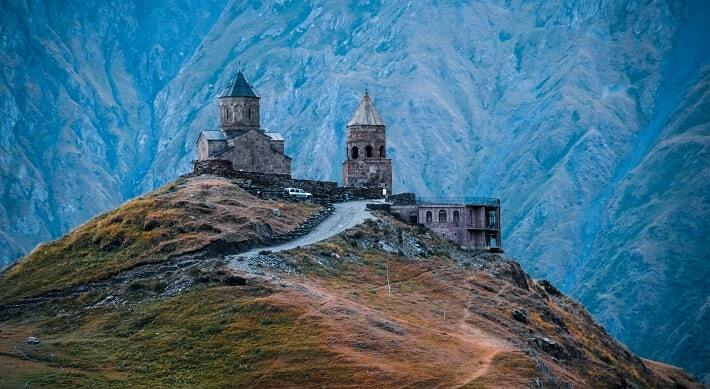 There are many, but two of them – the Okatse and Martvili, can easily be marked as some of the best Georgia tourist attractions. We decided to visit the Okatse canyon (42.45542/042.52757), which is a bit smaller and less touristy than Martvili, but like the Prometheus cave, we were denied with entrance due to our youngest traveler. 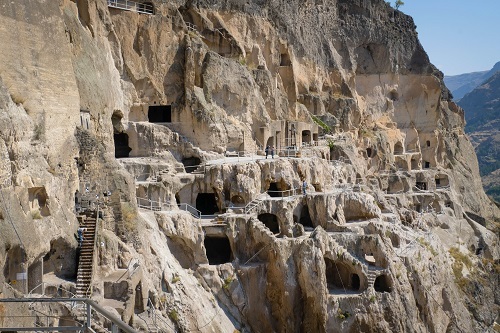 The Okatse canyon looks impressive mostly because it is similar to some kind of a sky walk, built 15 meters high above the ground and you can walk along the canyon. To reach this, you need to walk around 2 kilometers from the visitor’s center, where also tickets must be bough. You can also reach the place with a 4WD, which drives you on a pretty nice off-road. 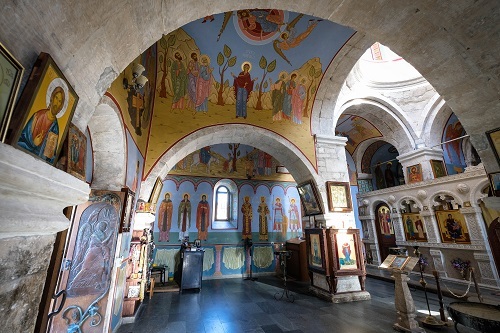 All the monasteries in Georgia are normally without any entrance fees. On the plateau just underneath the church wilderness camping is allowed. We slept in the car and there were few hikers with tents. Just watch out for wild horses, so pack your food well that horses cannot smell it and destroy your tent. 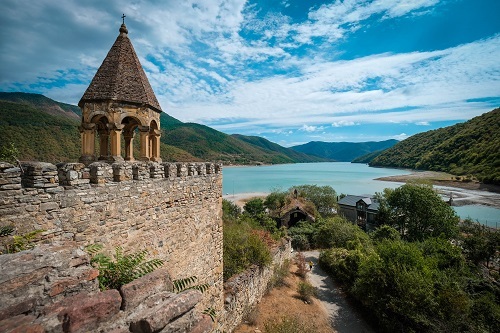 On your way to Kazbegi or back to Tbilisi is a nice stop at the Ananuri castle, along the Aragvi river. The capital of Georgia, Tbilisi, is for many just a starting and ending point for traveling around Georgia, but if you can spare 1-2 days for it, we definitely recommend it. 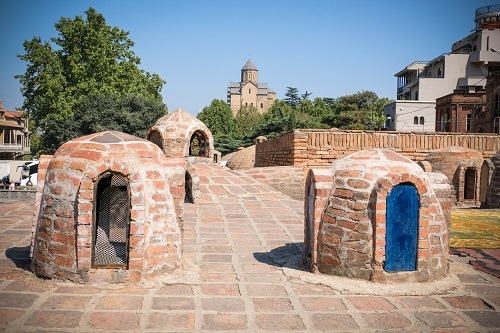 The old town of Tbilisi is pretty charming, especially as new and old go hand in hand there. 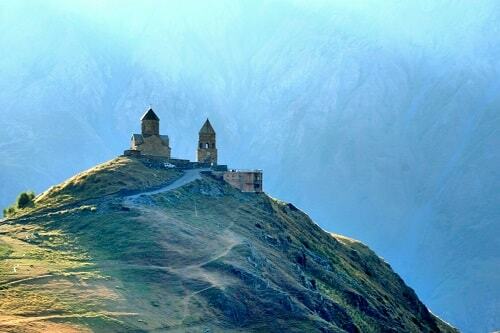 Check out more about Tbilisi tourist attractions here. Georgia is an absolute paradise for everyone who likes to spend their time outdoors and being active. The majority of the best places are in the north part of the country – hiking and mountain biking are best in Svaneti and Kazbegi. 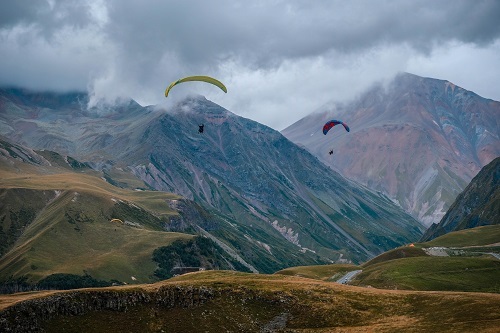 Reaching Kazbegi, you can also decide for wild water rafting, quad tours or paragliding. During winter, these regions are good for skiing, so don’t be too surprised to see the chairlifts. 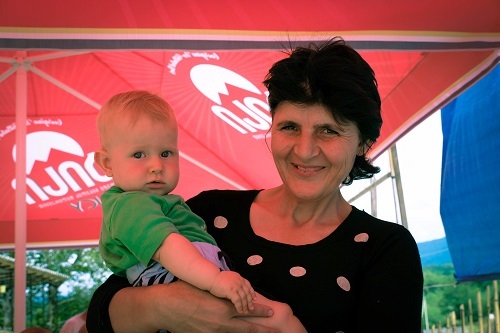 You can get more information about Svaneti here. 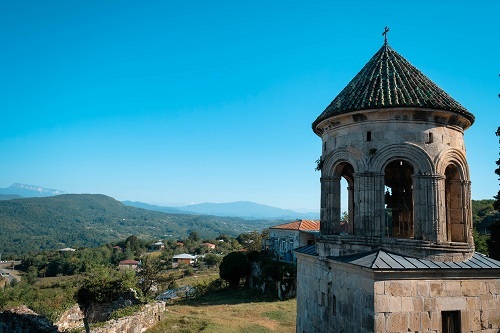 Georgia has some really interesting old towns, but we decided to visit only one – the stone town Vardzia – the city of Queen Tamar. The whole Georgia has some amazing roads, but you get the best ones on the north side of the country. 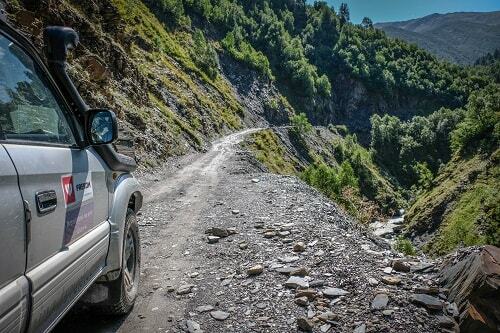 There are loads of high mountain passes, dirt roads and paths which can only be driven with 4WD. 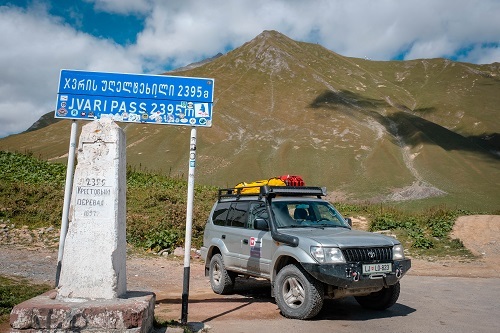 Some of mountain passes reach more than 3500 meters of altitude. If you ask us – 4WD enthusiasts, the most beautiful Georgia can only be seen if you have the 4-wheel drive. Due to some problems with the car our highest road we driven was over the Zagar mountain pass (2623 m), but the plan was to also overpass some roads over 3000 meters. Well, we now have a good excuse to be back, as the roads and the views are spectacular. 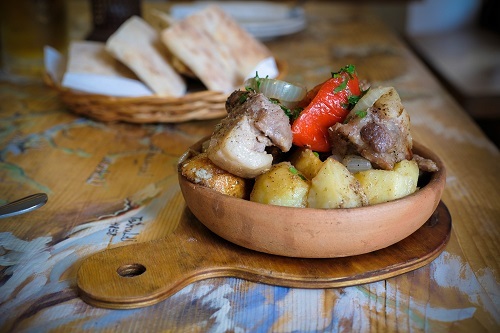 You cannot really get to know the country without tasting its traditional food, what for sure is one of the many tourist attractions in Georgia. Even though Georgia was part of formal Soviet Union, its culinary has more in common with Iran and Turkey than Russia. They use lots of veggies and meat as well. The most commonly use spices are cumin and coriander. You won’t miss when ordering different stews or baked potato with chunks of meat. If you are in a hurry, they also have an interesting selection of its fast-food. Get more information about food in Georgia here. The Georgian wine has such a special roll that we should never put it under food and drink in general. 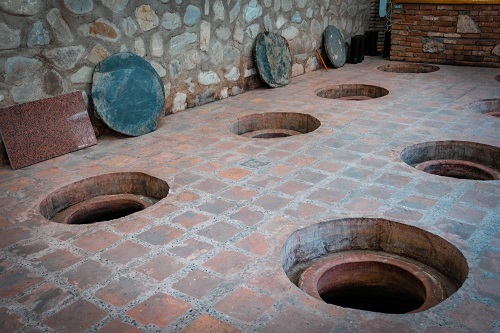 Did you know that Georgia has a special way of wine production? It is produced in clay pots called kvevri. The wine looks golden and has a bit of earthy flavor. Either you like it or not, but it is well worth the try. Georgian wine is so unique that people from all over the world come to Georgia just for the wine, so no wonder the wine is always put on the list as one of the best Georgia tourist attractions. Last but not least, there are always people who put icing on the cake. Who cares about rich history, culture and amazing nature if the people there are nothing to be remembered for but being rude and unwelcoming. Luckily, people in Georgia made our travel great and we did not have any bad experiences with them. 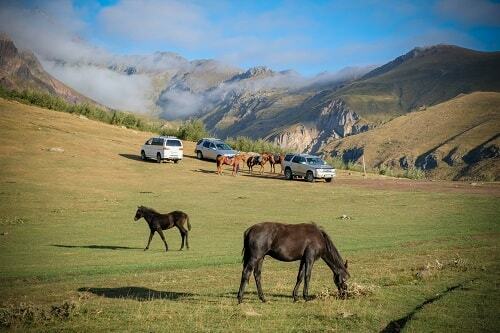 The north region of Kazbegi and Svaneti did impress us the most, but to get the whole picture, you should definitely make a round trip and see different Georgia tourist attractions. In general, Georgia is great for traveling. 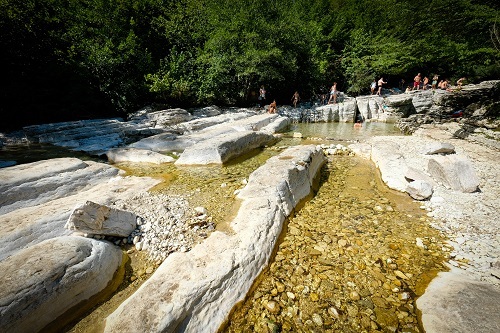 Seeing its fast tourism development, we would recommend you to visit it as soon as possible to still find unique and remote places, as mass tourism might ruin that way too fast.